Our Accounting and CFO Services are tailored for businesses without an in-house CPA, and we work best with owners seeking proactive business planning and advice. Our specialties include profitability ideas and cash flow planning for taxes and operations. Our Retirement Plan Administration Services provides third party administration and/or recordkeeping services for retirement plans, primarily 401(k) Plans and 403(b) Plans, to the business and not-for-profit community. The success of your business is important and we concur. Your choice of partners should be just as important. See why TPP is right for you. 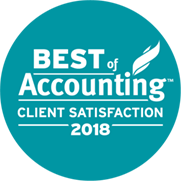 Fewer than 1% of all accounting firms in the United States and Canada have earned the 2018 Best Accounting Award for providing remarkable service quality to their clients. "My immediate response is EXCELLENT! We enjoy the close relationship and find the quality of their services of high value to our company." "A long term relationship based on trust, integrity and competence. TPP is a strategic partner for Argus and we look forward to many more years of working together. We have worked many issues together and Argus is better for it. Thank you!" - Kent Bredehoeft’s, Argus Consulting, Inc.
"TPP has shown their true value to mid-size companies like WattMaster. We trust them, their work and their advice." "Consistently high quality work. They do a great job of understanding my limitations in providing the information they need, and working around that." "TPP goes beyond just "doing the accounting". They LISTEN they ask questions, they look for solutions that will help your business be more profitable. 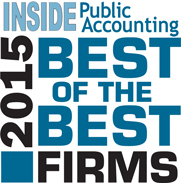 In almost 30 years in business this is the ONLY accounting firm I have ever recommended." - Kandy Meehan-Gibson, Home Rental Services, Inc.
"We have been with the company for over 35 years. We've never had a reason to look elsewhere as they have always taken care of us." - Dalton Hermes, Hermes Company, Inc.
"Top notch! We have worked with TPP for 18 years and over the years have found their service and their people to be top notch." - Bill Ryan, Ryan Transportation Service, Inc.
"Throughout the entire project, the partners at TPP never left us waiting for answers. After understanding our situation, they solved our problems quickly and efficiently. We look forward to continuing our relationship." "Second to none! Their service is very, very excellent and they are number one in my book." "Quick response on submitted questions and answers. Helpful getting out notices, eligibility questions and updating plan documents." - Jody Argo, Community Blood Center of the Ozarks, Inc.
"Excellent. Reports are easy to read and all our questions were answered." - Ron Wosel, Owner, C&R Manufacturing, Inc.
"With TPP CFO & Accounting Resources, I have peace of mind. If their team comes across a problem, they just fix it." - Merrie Jo Pitera, CEO, Litigation Insights. "Great communication, personable people, high characer, proactive relative to my needs." Litigation Insights provides litigation services to law firms throughout the U.S. and abroad. Eighty percent of their work involves jury research, including mock trials and deliberation groups. The remaining portion involves animated graphics (such as accident reenactment) and presentation technology for trials. Through our objective perspective, we see opportunities for profitability and cost savings that you may not. Year after year, we’ve consistently provided client ideas resulting in over $1 million of annual value from cost savings, lower taxes and higher profits. We provide incentives to our associates to complete projects timely and accurately. On average, we complete projects within 10 days after we receive all the necessary information. Clients rely on their Financial Advisor for investment advice, and they rely on us for retirement plan administration, record-keeping, and plan design and implementation. Carmel, Ind. 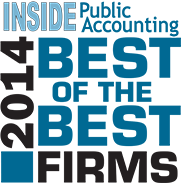 (August 30, 2018) – Continuing the tradition of more than 25 years, INSIDE Public Accounting’s (IPA’s) has unveiled the 2018 list of the Best of the Best public accounting firms in the nation. This group, the highest performers within the profession, are ranked on more than 50 metrics. The 2018 Best of the Best firms produce superior financial results while planning for long-term, sustainable growth. Best of the Best firms represent the top 10% of all firms that participated in the 2018 IPA Survey and Analysis of Firms. IPA’s proprietary scoring formula looks at a variety of metrics related to growth, income, productivity, tools of governance, staff turnover, time management and other areas that speak to the framework of the firm to determine the Best of the Best. Two-thirds of the Best of the Best firms appeared on the appeared in both 2016 and 2017, demonstrating an impressive commitment to excellence and sustainability. They represent what is possible in a public accounting firm and are the peer group that high-performing firms can benchmark themselves against. 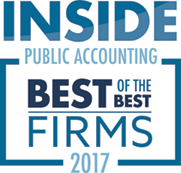 Overland Park, KS – February 19, 2018 – TPP Certified Public Accountants, a leading accounting firm announced today they have won Inavero’s Best of Accounting™ Award for providing superior service to their clients. The Best of Accounting Award winners have proven to be industry leaders in service quality based completely on the ratings given to them by their clients. Results used the firm’s Net Promoter Score (NPS), a customer satisfaction survey that measures the loyalty that exists between a provider and a business. Net Promoter Scores are used by more than two-thirds of Fortune 1000 companies, and often act as a leading indicator of an organization’s growth. Best of Accounting by inavero (2018, February 20).Click here for more information.